Rhythmic montage, though similar in nature to metric montage, differs in that the rhythm is produced not solely from the metric length of the shot, but from the movement within the frame and pacing of the action (Aitkins 31). Movement in this instance could refer to the physical motion of an object or the movement of the camera over an immobile object (Eisenstein 75). Psychological effect thus takes place not simply by increasing the rate of cuts, but by introducing new elements within the sequence that violate the structure of “metrical demands” (Eisenstein 74). For example, tension in this case could be applied with the addition of movement within the shot that appears unsynchronized to the pace of cutting, resulting in a new level of intensity. A perfect example of this is found in Eisenstein's own Battleship Potemkin, as the soldiers march down the Odessa Steps, the rhythm of their marching appears disorienting and intense when paired with the metric cutting of the sequence. Aitken, Ian. European Film Theory and Cinema :A Critical Introduction. Edinburgh: Edinburgh University Press, 2001. Print. Eisenstein, Sergei. Film Form [and]the Film Sense; Two Complete and Unabridged Works. New York: Meridian Books, 1957. Print. Luminous actress who made an indelible impression in her first feature film appearance, as the discontented wife inBed and Sofa (1927, Abram Room). She followed this up with strong performances in New Babylon (1929, Grigori Kozintsev and Leonid Trauberg) and A Fragment of Empire (1929, Fridrikh Ermler), but appeared in only a handful of films after this. Semyonova resurfaced after a long break for a final screen appearance in Andrei Tarkovsky's debut, The Steamroller and the Violin (1961). Pudovkin defines this editing technique occurring mostly in the climax of American films. The purpose is to create a overwhelming sense of tension constructed from “the simultaneous rapid development of two actions, in which the outcome of one depends on the outcome of the other”, thereby forcing the audience to question if the characters will “make it on time” or survive (Pudovkin 77). Pudovkin, Vsevolod Illarionovich. Film Technique :And Film Acting. Memorial ed. London: Vision press, 1958. Print. This economic and political theory argues that public ownership should regulate the means of production and trade. Individuals will be unable to take personal control of collective resources. Each member of society will have the right to participate in debates and influences policies and social decisions that concern them. Socialism also ensures that individuals have free access to the goods and services to meet their needs such as health care, education and other necessities. According to the Marxist analysis, socialism is a stepping-stone to Communism in that it represents the transition from a capitalist state to a communist state. Lichtheim, G., A Short History of Socialism. New York: Praeger Publishers, 1970. Malia, Martin. The Soviet Tragedy: A History of Socialism in Russia 1917-1991. New York: Free Press, 1994. While the post-revolution Soviet film industry encouraged experimentation in form and structure, influencing the budding avant-garde movement, by 1935 the Stalin government had initiated a change. The result was a jettison of “excessively formal” methods as exemplified by the increasingly experimental efforts of the montage directors, in exchange for socialist realism, a policy dictating that “all artworks must depict revolutionary development while being firmly grounded in realism” (Bordwell Art 481). The essential focus was an emphasis on Communist solidarity in which “artists had to propagate the Communist party's policies and ideology”, while depicting “the life of ordinary people in a sympathetic way” (Bordwell History 294). This resulted in an idealized representation of Soviet society that did not necessarily present an authentic depiction of life under Stalin's rule. Bordwell, David, and Kristin Thompson. Film Art :An Introduction. 7th ed. Boston: McGraw-Hill, 2004. Print. Thompson, Kristin, and David Bordwell. Film History :An Introduction. New York: McGraw-Hill, 1994. Print. This scene is from Chapayev (1934), one of the first films to follow the Socialist Realist doctrine. Note how the film's style differs from Montage cinema, featuring less eccentric performances and editing techniques that emphasize continuity over experimentation. Film studio founded in 1924 as a replacement for Goskino, whose control over distribution it was given. Under the chairmanship of veteran Party member I.P. Trainin, Sovkino pursued an aggressive policy of importing and distributing foreign films to finance domestic production of Western-style entertainment films, discouraging the making of both agit films and avant-garde experimentation. This attracted criticism from all sides, and Trainin’s Bolshevik credentials offered little protection following the 1928 Party Conference on Cinema, much of which consisted of attacks on Sovkino. In fact, the studio did produce a number of experimental films along with its commercial fare and, predictably, this was also the subject of criticism. The studio underwent a series of purges in 1929-1930, but continued to produce films until 1932. Among its notable films were: One Sixth of the World (1926, Dziga Vertov), The Wings of a Serf (1926, Yuri Tarich), Katka the Apple Seller (1926, Fridrikh Ermler), Bed and Sofa (1927, Abram Room), October (1928, Sergei M. Eisenstein and Grigori Aleksandrov), Women of Ryazan (1928, Olga Preobrazhenskaya and Ivan Pravov), Eliso (1928, Nikoloz Shengeleya), New Babylon (1929, Grigori Kozintsev and Leonid Trauberg), A Fragment of Empire (1929, Fridrikh Ermler), Old and New (1929, Sergei M. Eisenstein and Grigori Aleksandrov) and China Express (1930, Ilya Trauberg). 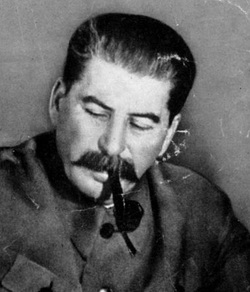 Stalin was General Secretary of the Central Committee of the Soviet Union's Communist Party between 1922 and1953. After Lenin's death in 1924, he engaged in a successful struggle for power with Leon Trotsky and emerged as de facto dictator. Stalin’s concept of "socialism in one country" came in the form of his Five-Year Plans beginning in 1927, which forced collectivization and industrialization across the nation. Farmers were exploited as much of the nation’s food was exported culminating in The Great Famine (1932) and later The Great Terror (1936). Under his harsh rule, the Soviet Union became an industrial and military superpower on the world stage. McNeal, Robert. Stalin: Man and Ruler. Hampshire: Macmillan, 1988. Montefiore, Simon. Young Stalin. New York: Alfred A. Knopf, 2007. Shukman, Harold. Stalin: Triumph and Tragedy. London: Weidenfeld and Nicolson, 1991. Ree, E. Van. “Stalin as a Marxist Philosopher”. Studies in East European Thought, Vol. 52.4 (Dec. 2000), pp. 259-308. Ukrainian-born actress who was discovered by Russian stage director and acting teacher Konstantin Stanislavsky. She made her film debut with a bit part in Miss Mend (1926, Boris Barnet) and then became a star in Russia with lead roles in The Girl with the Hatbox (1927, Boris Barnet) and Land in Captivity (1928, Fyodor Otsep). She emigrated in 1929 to star in German films such as The Brothers Karamazov (1931, Fyodor Otsep) before moving on to Hollywood in 1934. Despite playing several lead roles, she never caught on as a star in the United States and soon specialized in character parts. Innovative cinematographer most celebrated for his work with Sergei M. Eisenstein, for whom he photographed (alone or in collaboration) Strike (1925), Battleship Potemkin (1925), October (1928), Old and New (1929), Que Viva Mexico! (1932-58), Bezhin Meadow (1937) and Alexander Nevsky (1938). Other films he worked on include The Bear’s Wedding (1926, Konstantin Eggert and Vladimir Gardin) and Aerograd (1935, Alexander Dovzhenko). Tonal montage is created by the atmospheric linking, or tone, of a section of shots or in a sequence (Aiktin 31). This tone is determined through compositional elements which produce an “emotional designation” that becomes applied to the entirety of the section. Eisenstein gives the example of diminished illumination resulting in gloom as “light tonality” or the harsh angles of a frame creating a shrill feeling as “graphic tonality” (Eisenstein 76). Rhythmic montage also works in conjunction with tonal montage to determine mood through associative rhythm; the repetitive motion of tides for instance, becomes indicative of the image's emotional calmness, and when paired with other characteristically calm movements, results in an overall tone of serenity. An Example of Tonal Montage from Battleship Potemkin. Born Lev Bronshtein, Trotsky was a Marxist theorist, Soviet politician, and leader of the Red Army. After years in exile for adamantly opposing Tsar Nicholas II, he returned to Russia and joined the Bolsheviks in 1917. He played an important role in the organization of the October Revolution, was the Commissar for Foreign Affairs (1917-1918) and the Commissar for War (1918-1925). Trotsky’s struggle with Stalin forced him into exile in 1929. He was assassinated as per Stalin’s request in Mexico in 1940. Knei-Paz, Baruch. The Social and Political Thought of Leon Trotsky. Oxford: Clarendon Press, 1978. Service, Robert. Trotsky: a Biography. Cambridge: Harvard University Press, 2009. Trotsky, Leon. My Life: An Attempt at an Autobiography. New York: Dover Publications, 2007. In an effort to de-emphasize the bourgeois individual, many Soviet filmmakers disregarded the notion of the “star” and would resort instead to the use of non-actors. David Bordwell calls this practice “typage” as filmmakers would “often choose an individual whose physical appearance seemed at once to convey the type of character he or she was to play.” (Film Art 481). This process would also allow the easy identification and association with an “actor” to the social class or profession that they are representing. For example, the peasant heroine of Old and New or the rich bourgeois characters of Strike are immediately associated with the social class they represent due to their visual iconography reflecting those roles. In this scene from Old and New, the social class of the peasants is immediately recognizable.